Linear guide slides (also known as linear bearing slides) are linear translation stages designed for precise low friction linear movement and are available in roller or ball designs. They can receive loads in any direction and achieve linear movement with extremely high accuracy while providing exceptionally smooth operation. They are ideal for a wide variety of industrial applications such as CNC and laser-machining centers, drilling machines, grinding machines, material handling equipment, industrial robots, medical and optical equipment and other instruments and devices. Gilman USA linear guide slides are designed for speed and accuracy and at the same time high levels of loading. The recirculating balls or rollers provide a high number of effective contact points, and the preload of the bearing assembly ensures a high level of accuracy. 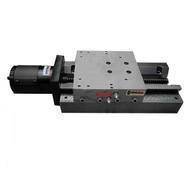 An important characteristic of the linear bearing slides is the ability to accept this high loading from any direction. The high quality of these slides is achieved by precision grinding of rail and bearing mounting surfaces to assure high accuracy. 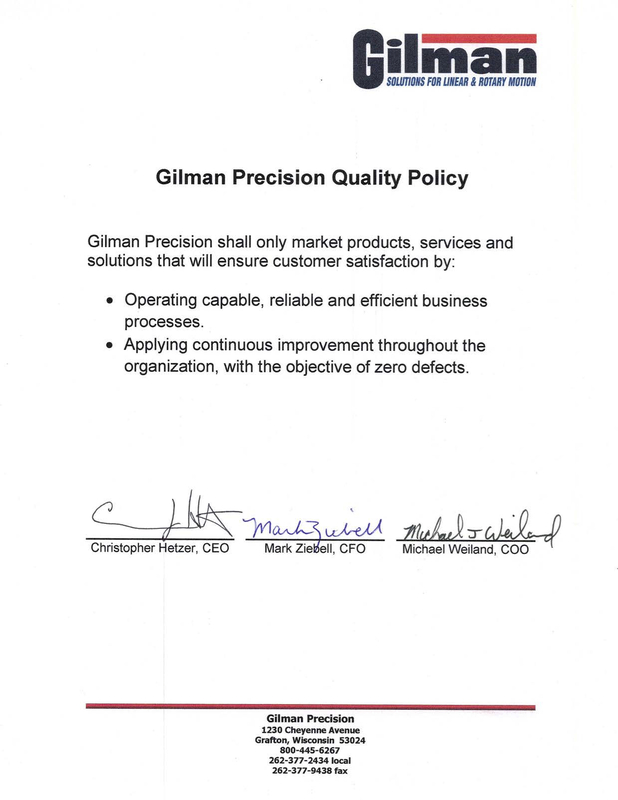 To maintain that high quality, Gilman USA offers metal or fabric covers and coatings for hazardous environments. These coatings resist wear, chemicals and corrosion. Some coatings offer high temperature stability, nonstick surfaces and dry film lubrication. Gilman USA’s facilities, equipment and application engineering assistance help solve your most challenging design problems. Our ISO 18000 quality standards assure that our products have the highest accuracy, reliability, precision and durability. To view our full range of linear guid slides, please select from the following options. There are applications where linear guide slides are not preloaded, although preload is usually preferred because it eliminates internal clearance and increases rigidity. Balls and rollers used as rolling elements significantly differ in regard to elastic deformation under load. Elastic deformation of a roller resembles that of a linear spring, while the ball shows characteristics of a non-linear spring. Therefore, the roller generally features a smaller amount of elastic deformation and a higher rigidity than the ball. The purpose of preload is to reduce elastic deformation caused by the load. This increases the rigidity of the linear bearing slide by applying an internal stress in advance to the contact area between the raceways and rolling elements. It may be theorized that the effect of the preload on ball slides is more apparent than on roller slides because of the differences in deformation characteristics. However, excessive preload should be avoided, because it creates various negative effects on the slides such as shorter life, high friction and increased temperatures. The static (start-up) friction of a linear guide slide is much lower than that of a conventional plain slide. Similarly, the difference between static friction and dynamic friction (kinetic friction) is also minimal. This accounts for the ability of linear bearing slides to reduce power consumption, lower operating temperatures and increase the overall efficiency of these units. The frictional resistance of these slides varies with their type, load, traveling speed and lubricant. Generally, lubrication has more effect with light loads and high speed operations, while load has more effect under heavy loads and low speed operation. For sealed guides, it is necessary to add the frictional resistance of the seals which varies with lubricant and the interference fit of the seals. Also, a large moment load or an excessive preload will increase the frictional resistance. The primary purpose of lubrication for linear guide slides is to keep raceways, rolling elements and cages from direct metal–to–metal contact, thereby reducing wear and friction. The performance of these slides is usually influenced by the lubricant and lubrication method. It is important to select an adequate lubricant and lubrication method in accordance with the type of bearing, load, operating speed, etc. However, compared with conventional plain slides, the necessary amount of lubricant for linear bearing slides is much smaller, and the interval between lubrication periods can be much longer. This will help reduce maintenance and cost. These slides may use either grease or oil for lubrication depending upon the application. For grease lubrication, a lithium–soap base grease (consistency no. 2) is commonly used. For slides operating under heavy load, a grease containing extreme pressure additive is recommended. For oil lubrication, heavier loads require a higher viscosity oil, and a higher operating speed requires lower viscosity. For operation under heavy loads or high moment loads, a lubricating oil of around 68 cSt may be successfully used. For lighter loads, higher operation speeds, or where extremely smooth movement is required, a lower kinematic viscosity oil of around 13 cSt may be employed.